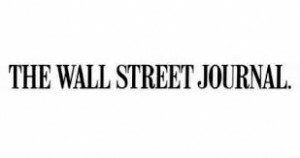 WSJ: Number of Job Openings Hits 13 Year High! - Direct Recruiters Inc. The number of job openings across the U.S. reached a fresh 13-year high in August, a sign this year’s strong job growth could stretch into the fall. Employers had 4.84 million open positions in August, up from 4.61 million in July and the highest level since early 2001, the Labor Department said Tuesday. Meanwhile, steady job creation has decreased the number of job seekers, a sign the labor market is tightening and raising the prospect of stronger wage growth. In August, there were just under two unemployed workers per job opening, the lowest level since the recession. In 2009, that figure was nearly seven. A tighter labor market eventually could lead to higher wages for U.S. workers. Salaries have been growing at a tepid pace in recent years. In September, average hourly earnings for private-sector employees increased 2% from the previous year, barely faster than consumer-price inflation, Friday’s employment report showed. But as companies seek to fill more jobs and the pool of job hunters shrinks, they may have to offer higher wages to fill them. “The survey is now screaming that upward pressure on wage gains is just a matter of time,” Pantheon Macroeconomics chief economist Ian Shepherdson said in a note to clients, referring to Tuesday’s report. The last time the proportion of job openings to overall employment was at August’s level, wages were growing at a 4% rate, he noted. 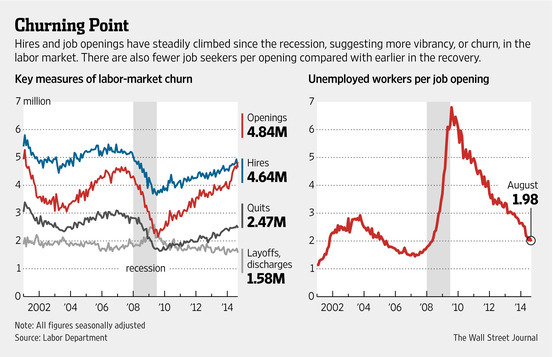 Still, other figures suggest the labor market is growing below its potential. Despite the pickup in job openings in August, the number of hires actually fell to 4.6 million from 4.9 million in July. That could be a sign that while employers are ready to expand, they are having trouble finding the right workers or they lack urgency to hire immediately. Moreover, the number of workers quitting their jobs has remained flat in recent months. That shows that despite stronger employment growth, many workers still aren’t confident enough to quit their jobs for better opportunities. Friday’s employment report showed overall job creation returned to a robust pace in September, with employers adding 248,000 jobs and the unemployment rate falling to 5.9%. Federal Reserve officials are scrutinizing such reports to gauge the strength of the labor market as they consider when and how to raise short-term interest rates.